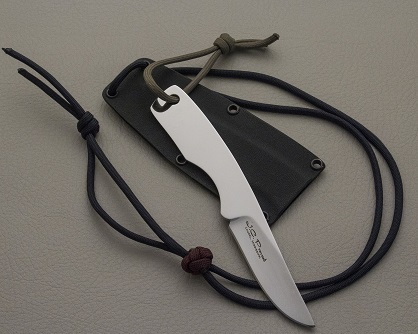 Hakkapella Damasteel Dagger with fluted mammoth ivory with twisted sterling silver handle . 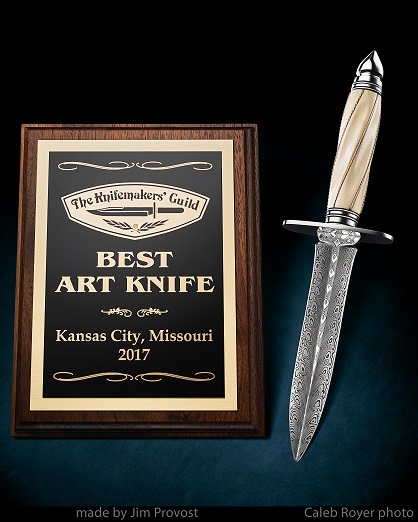 Best art knife from the Knifemakers' Guild at the ICCE Knifemakers' show. 5-1/2"Damasteel "Thor" drop point knife, cryo quench, taper tang(CPM 154), and 416ss guard with fossilized mammoth ivory handle. Custom sheath and stand..
4" Damasteel "Thor" drop point knife, cryo quench, taper tang, and 416ss bolster with stabilized blue maple burl handle. 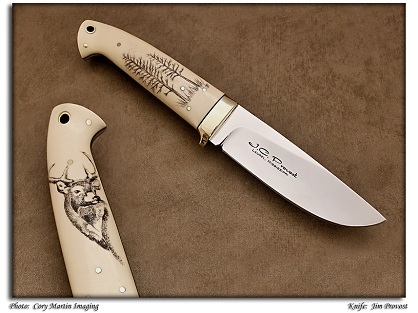 Custom sheath and stand..
Engraving with 24K gold by Jared Eason. 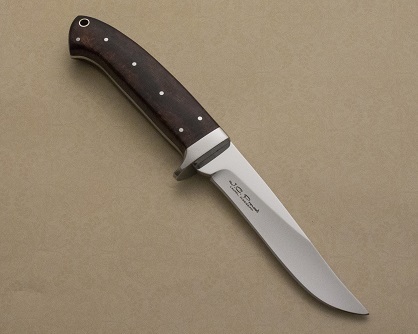 In stock at Laurel Nursery and Garden This knife is featured in the December, 2013 Knife World Magazine. 440c Bowie with stabilized dyed box elder burl and axis crown handle. 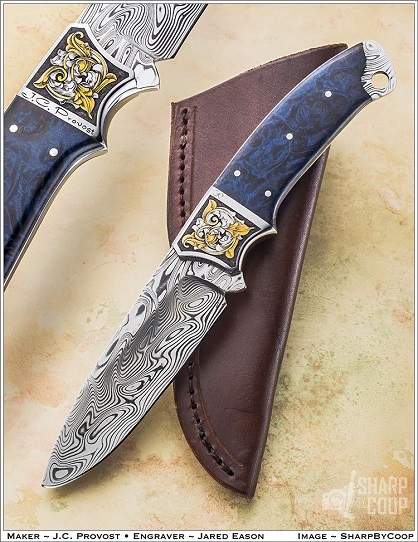 Sold at Smith & Sons Knives. 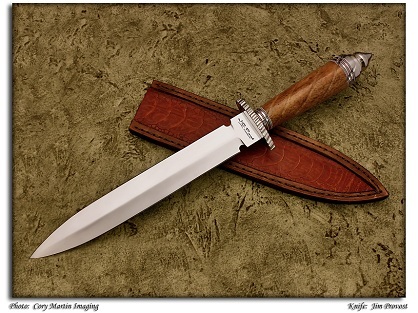 This knife is featured in the December, 2013 Knife World Magazine..
CPM 154CM White Micarta Scrimshawed Drop Point Hunter. Scrimshaw by Joanna Provost. 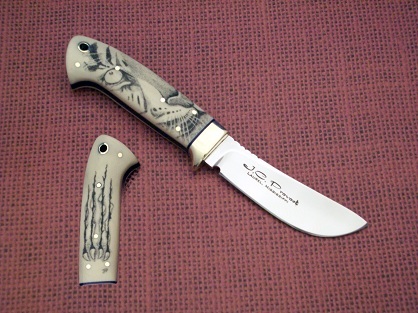 Sold at the National Blade Show in Alanta, GA. 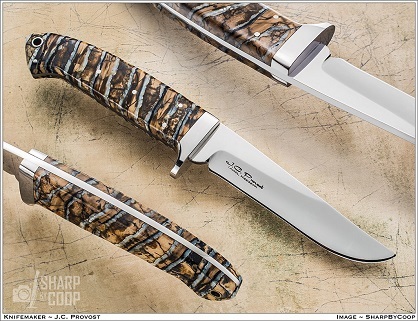 This knife is featured in the December, 2013 Knife World Magazine. 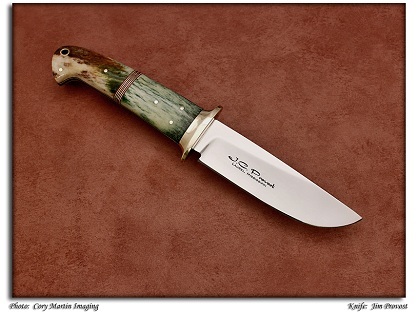 CPM 154CM Drop point hunter with dyed stabilized box elder burl handle. 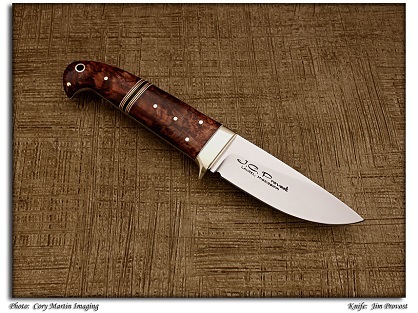 This knife is featured in the December, 2013 Knife World Magazine. 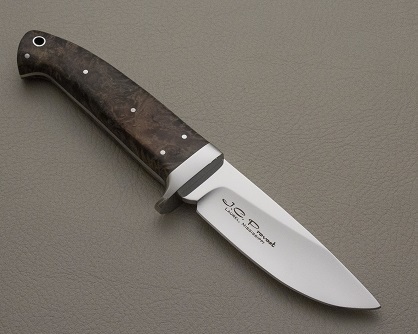 CPM 154CM Drop Point Hunter with Dyed White Bone handle. Sold at Rock Hard Designs. CPM 154CM Drop Point Skinner scrimshawed on white micarta handle. 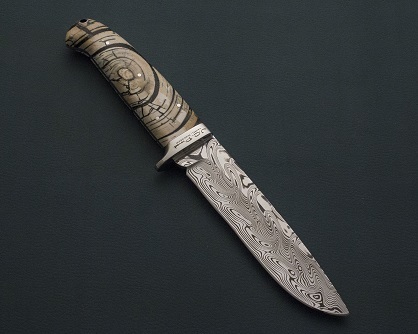 This knife was written about in the December, 2013 Knife World Magazine. CPM154 neck knife, cryo quench, and taper tang. Custom sheath. 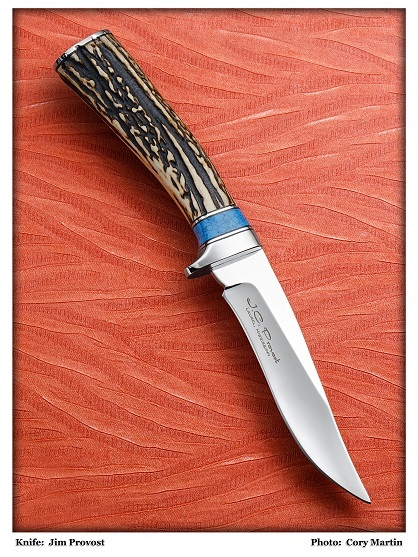 CPM 154 5" Hunter, cryo quench, hidden tang, 416ss fittings, with exhibition stag / turquoise spacer handle. Custom sheath. New at Laurel Nursery and Garden. 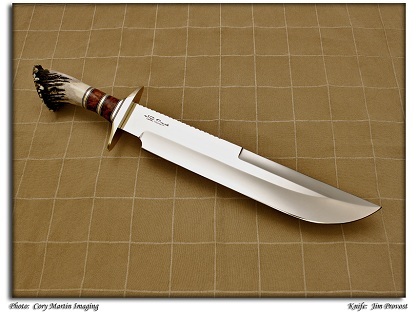 CPM 154 4-1/2" hunting knife, cryo quench, taper tang, and 416ss guard with fossilized mammoth ivory handle. Custom sheath. 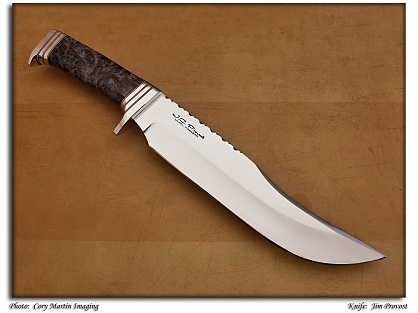 CPM 154 4-1/2" hunting knife, cryo quench, taper tang, and 416ss guard with fossilized mammoth tooth handle. Custom sheath. 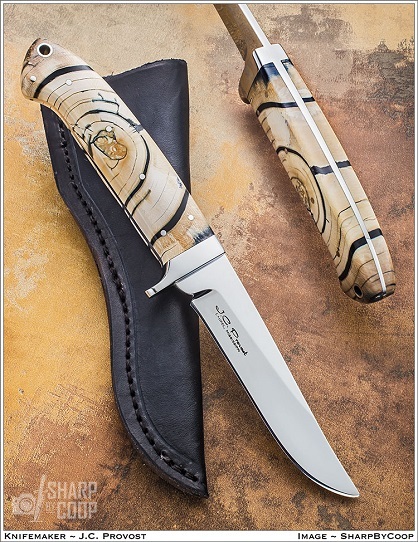 CPM 154 3-1/2" Drop point knife, cryo quench, taper tang, and 416ss guard with stabilized CA buckeye burl handle with inlay. Custom sheath. 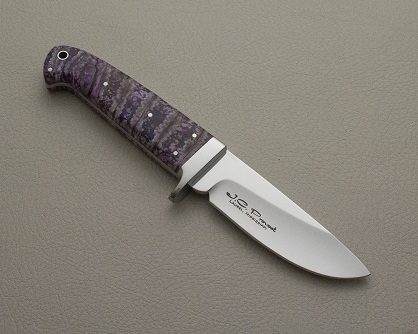 CPM154 4" drop point, Cryo quench, taper tang, 416ss guard with stabilized mammoth purple tooth handle. Custom sheath. CPM154 5" Hunter, Cryo quench, 416ss guard, and taper tang with Ironwood burl handle. Custom sheath. 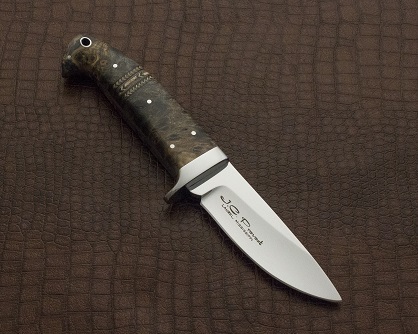 CPM154 4" Drop point knife, Cryo quench, taper tang, 416ss guard with stabilized maple burl handle. Custom sheath. 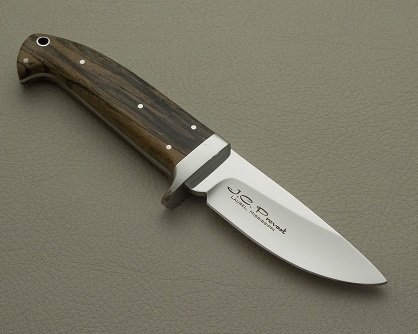 CPM154 3-1/2" drop point knife, cryo quench, taper tang, and 416ss guard with stabilized black/white ebony handle. Custom sheath.